The 2014 China Agricultural Machinery Parts and Components Industry Summit was held in Weifang, Shandong from August 4th to 6th. It is an annual conference organized by the China Association of Agricultural Machinery Manufacturers (CAAMM) aimed at sharing industry observations and improving communication between leading agricultural machinery parts and components manufacturers and experts of this market. Stieler Enterprise Management Consulting has nearly 20 years of experience in this industry all over the world and has opened its Shanghai office since 2011. This year, Mr Georg Stieler, Managing Director of Stieler Enterprise Management Consulting in Shanghai, was invited by the organizers to make a speech titled Success formulas of leading Western agricultural component suppliers. 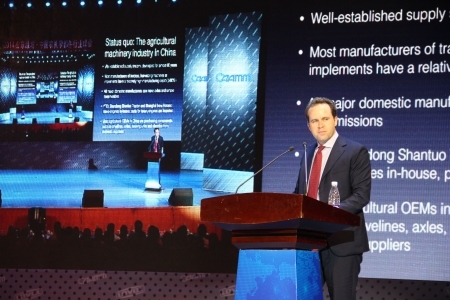 After a brief introduction to the status quo of the agricultural machinery industry in China, Mr Stieler acknowledged its great potential but also objectively pointed out that despite the rapid development of this segment, many key components such as high-power engines, CVT drives and sophisticated hydraulics still have to be imported from overseas. He then elaborated on the differences between the markets of the early-industrialized countries and of China by analyzing through the end customers, buying criteria, OEMs, regulatory framework and other factors. Subsequently, Mr Stieler explained what foreign companies are doing differently in terms of strategy, operations and technology. The most fundamental difference between Western component suppliers and their Chinese counterparts is that Western suppliers offer complete system solutions instead of just selling parts. Mr Stieler concluded his speech with a comparison of the different options for partnerships between Chinese and Western component suppliers. He gave examples of successful takeovers and explained how shortcomings of the legal system in China as well as operational weaknesses have, to some extent, sabotaged the cooperation potential. In Mr Stieler’s opinion, the trend of hiring experienced Chinese managers instead of combining the whole business is gaining momentum. The speech was widely well received by the audience. The summit participants responded actively to Mr Stieler’s presentation by expressing their interest in learning from the foreign companies and many leading manufacturers were determined to invest more in R&D to catch up with the industry standard of the more developed countries. The Summit was a great learning opportunity for both the Chinese manufacturers and the industry experts such as Stieler Enterprise Management Consulting.